This is something new I am creating, a new line of whimsical hand crafted jewelry. I am using a variety of art materials therefore I am calling my line Sally's Little Bits of This and That. 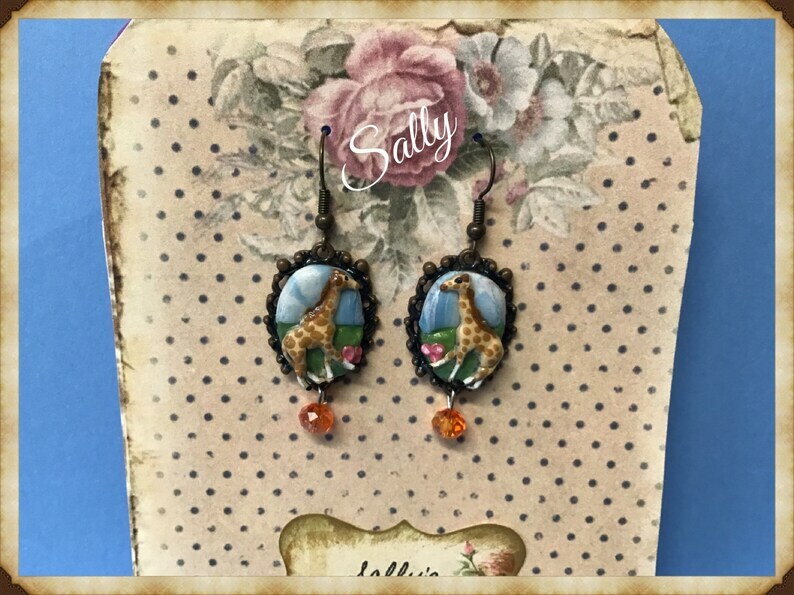 These are some whimsical Giraffe Earrings, made with a combination of metal, wire and polymer clay. Hand painted and glazed. The french hooks are a bronze color. Even though I may make more like these no two will ever be alike. Please see the photo with the ruler to show you the size. YOU WILL RECEIVE THE EXACT EARRINGS SHOWN AND MY HOME IS SMOKE FREE. LOW PRICED SHIPPING AND PACKAGE WILL SHIP NEXT BUSINESS DAY.